Once you go black, you... keep vacillating back and forth for the rest of time. The Venom symbiote gives Peter Parker a black suit with special, enhanced powers. Yes it does, but that doesn't tell us anything about this figure, does it? When this series was revealed, I didn't know what this suit was supposed to represent. Was it something from the "Spider-Verse" crossover? Was it Poison before he forgot to smack it up, flip it, and then rub it down? Oh, no! This is the real, main, 616 Peter Parker, wearing the real, main, 616 Venom suit. How could such a thing be? Because Spider-Man was unable to deal with Red Goblin on his own, Eddie Brock lent him the symbiote to even the odds. When they joined, Spidey ended up with this fancy new look. Why this design and not some other one? No reason. At least, none brought up in the story. Seems to just be what the artist felt like drawing. 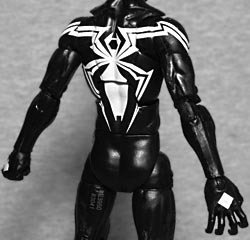 Symbiote Spidey uses the body you expect he would, the super-skinny, super-articulated one that so many Spiders-Men have used. Like Lasher, he has bare feet and hands with claws, but also gets alternate fists, because the symbiote still fires its webs out of the back of its hands, rather than the inside of its wrists. In the comic this suit was drawn with armpit webs that the toy lacks, but that's for the best. The suit is mainly black, of course, with a big white spider on the chest. That's how it's looked since the beginning, so no need to change now. That said, it's not the same pattern we're used to seeing on the black costume: the two front legs run out over the shoulders, while the two back legs stay in the center of the body - a little bit "Scarlet Spider"-ish. The oddest feature is the way the white eyes lift off the surface of the face at the edges. What's that about? I'd never really noticed before how far the hips on this mold stick out from the front of the trunk: if you have the figure standing straight up and view it from the side, it's kind of ridiculous. Of course, this is a Spider-Man, so how often would he just be standing straight up? Posing him even a little bit hides the issue. If you worry about all the paint apps lining up perfectly, you'll probably be unhappy with the many shoulder joints, but try not to let it get you down. The figure's only accessories are alternate hands - like we said, he gets either open hands or fists. He does include two pieces of the Kingpin Build-A-Figure, though: two heads with alternate expressions. 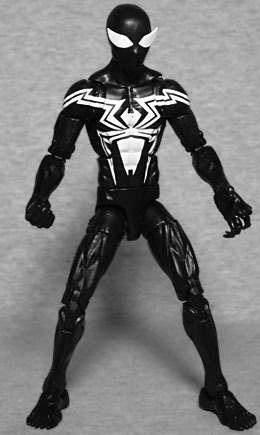 Symbiote Spider-Man is one of the less-exciting releases in this series, no doubt, but he's great for pairing with Red Goblin, and provides a unique new look.